We have now been living in Michigan a couple of months now & I’m finally starting to do things that I love that are not necessarily just for our Michigan casa. Things like creating art, painting furniture, & stocking our booth. This past week I painted a homely looking bookshelf for our booth & you’ll never guess what color I painted it… gray. Seriously the few pieces of furniture I have painted since we have been in Michigan, like this chair [here], have all been gray. I promise I have another furniture makeover coming very soon that is not gray & I will branch out to new colors soon. I just love gray. It’s different than white, it’s neutral, it’s warm, yah.. I just love it. 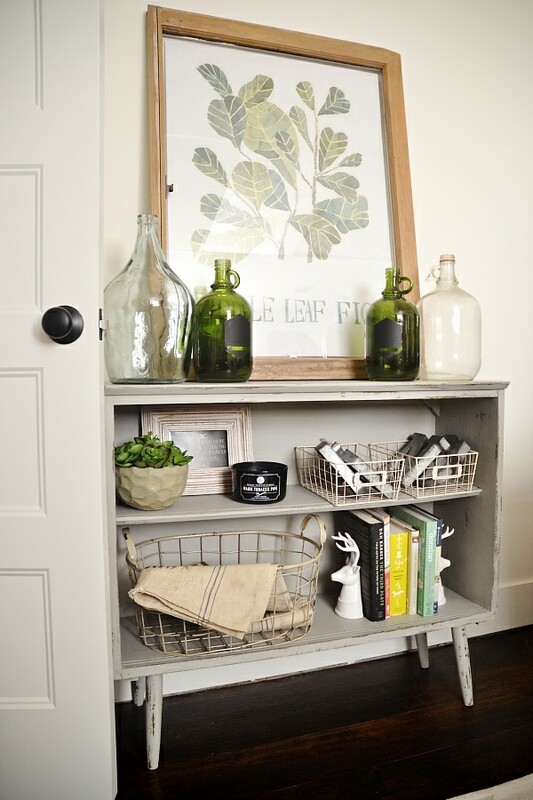 This little leggy bookshelf needed some love & I think the gray paint gave it a whole new life that it needed. Fiddle fig print: unkown. It’s been so long I forget. If you know leave it in the comments below! Thank you! I have been enjoying your emails for a couple of months now. I am probably older than your parents – I am young at heart though. I do like the little bookshelf and I liked the chair you did as well. I would love to see some color! How about turquoise? I am really liking it as an accent for my home in which I have lots of red. Super fresh & spring-ishhh! Btw I love your late night postings hahah night-owls reunite ;)! Happy week! Thank you for taking lots of pics I love that you do that! Love the beauty you find in things! I love the grey!! The walls in my rental are grey, which I love, but our furniture and rugs are mostly browns, so it’s kind of a weird mash-up right now. This bookcase makes me want to take the 10 hour drive to your booth!! EEEK SO COOL! Wow……from drab to fab. What a difference that gray paint made. You certainly have an eye for seeing the beauty in things and of course your styling of the leggy bookshelf makes it even more fabulous looking!! The little gray bookshelf is so cute! Great job! I, also, am probably about your parents’ age, but love getting your emails. Checking out thrift stores, second-hand stores and junque shops is my favorite pastime to find treasures for our home. I enjoy your way of showing your latest projects intermingled with what’s going on in your life. Keep it up! Gray is one of my favorites, too, and this bookshelf is just striking! Plus, I love the staging and keep staring at that, too. Maybe it won’t sell and you will be forced to keep it! yes, love that! been looking for a leggy shelf myself to spice up my little ones room a little. but I do love that grey! idk if others think its boring, but I love it. I tend to get tired of colors fast so I play it safe with the furniture and can go crazy whenever I feel like it with the styling! LOL! I’m a huge fan of grey, so I say keep it up! 🙂 I don’t blame you for getting attached to this one. Love it! What an improvement! Am thinking I might put some legs like that on a bookshelf for my daughter’s house…Thanks for sharing. I love it! It looks like a piece right out of the 1960’s (the before!). I love gray, too, and I must have a zillion different shades (sounds like a movie!!). Can’t wait to see what else you are up to. I’m in Illinois, we have another home on a Michigan lake, too), and it’s too cold to paint anywhere. Thank you so so much Camille! That could very well be. I have been racking my brain the past few days and just can’t remember. I love it though! LOVE!!!! And the styling is ♥♥♥ !! Love your blog, cute idea’s! I am in the area and wondering when the bookshelf will be in the store? 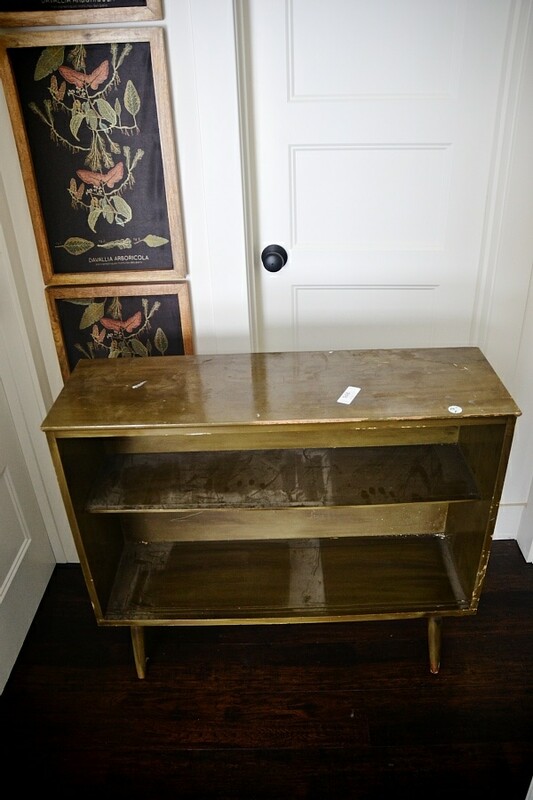 I have been looking for something like this for a spot in my house and this might be perfect! Welcome back to Michigan! New to your blog, and reallly like your posts! Michiganders unite! You might have mentioned before but I was wondering what kind of clear wax you use? Thanks & love your blog! That is sooo cute. I just love it! Nice job! Had the same bookcase and it lived in a VERY small utility/laundry room. We took the legs off the ironing board and attached it to the top of the bookcase. Two birds w/one stone.